In the last post on Implied Volatility, we downloaded real options data from the CBOE and calculated the volatility curves/surface. We saw the calculations of 30,000 implied volatilities in roughly 10 seconds. 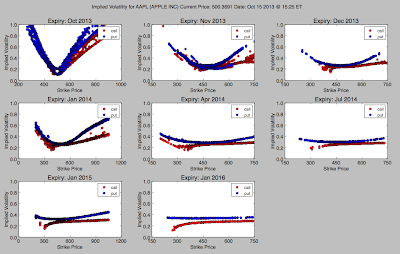 In this post we concentrate on the speed of calculating implied volatility via a variety of different methods. We look at the volatility curve/surface using Python's Scipy, the NAG Library for Python, and the NAG C Library. In addition, we've added a slider widget to the Python graphs from before to see the real-time effects of changing the interest and dividend rates (see the video below). All the code can be downloaded to produce the graphs, and a NAG license is not required for the case using scipy.optimize.fsolve. The script and utility methods can be downloaded from here. The script begins by generating sample option prices. These are fed through different root finding methods (chosen by the user) to back out the implied volatilities. 1) scipy (scipy.optimize.fsolve) - A wrapper around the hybrd and hybrj algorithms in the MINPACK Fortran library, followed by a Python Black-Scholes formula. 2) nag4py (The NAG Library for Python) - A wrapper (nag_zero_cont_funct_brent) around Brent's method for the root-finding, followed by nag_bsm_price for the Black-Scholes formula. 3) ctypes (The NAG C Library, Mark 23) - The same NAG functions as (2), but the looping and calculations are done directly in C, rather than through the nag4py wrapper layer. This requires building a shared library on your own machine, which is then loaded from the main script. Note that option (3) (ctypes) requires you to build a shared library. The build command for Windows, Linux and Mac can be found below. NAGCDIR should be the directory of your NAG C Library installation. The C code (nag_imp_vol.c) is included in the download. cl /LD /DLL /MD -I"NAGCDIR\include" nag_imp_vol.c /link /LIBPATH:"NAGCDIR\lib" "NAGCDIR\lib\nagc_nag_MD.lib"
We've added a timer around the first call when calculating the implied volatilities. You can also change n_strikes in implied_volatility.py to alter the total number of calculations. The base case uses 50 strikes, 5 expirations, and 2 option types (Call and Put) for a total of N = 50 * 5 * 2 = 500 implied volatilities. While scipy.fsolve looks considerable slower than nag4py, this is not the case. The differences in speed are a result of calling a pure python Black-Scholes formula vs. using nag4py's nag_bsm_price function. The times for fsolve and nag4py scale somewhat linearly, while the NAG C shared library doesn't. I suspect this is due to the overhead of preparing the data into numpy arrays before calling the shared library. If you encounter dependencies issues with Scipy or Matplotlib, we recommend switching to a Python distribution such as Anaconda or Canopy. The code uses serial implementations in NAG and Python. You could look at a more advanced version that uses multi-threading or call a function that solves a system of equations (scipy.optimize.root or nag_zero_nonlin_eqns_easy). The above analysis is a very oversimplified model of implied volatility. 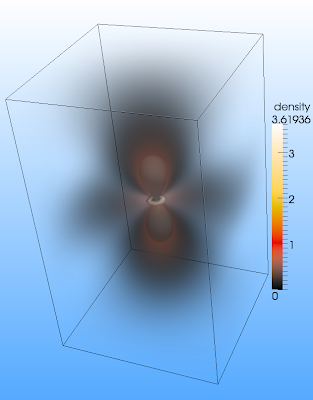 In practice, one should use a more complex model and look at other root-finding methods (such as the rational approximation). You can also increase the number of calculations past 4000, but Python seems to have trouble plotting and updating the graphs.